This collection came out almost exactly two years ago, but this was before I had even heard of Nubar. It's just not that widely available in the UK, which is a pity as they do some amazing colours. (The ones I do have are from BeautyBay, which has a pretty good selection.) Anyway, I recently purchased two of the colours from the Prism Collection, which I thought I'd show you today. 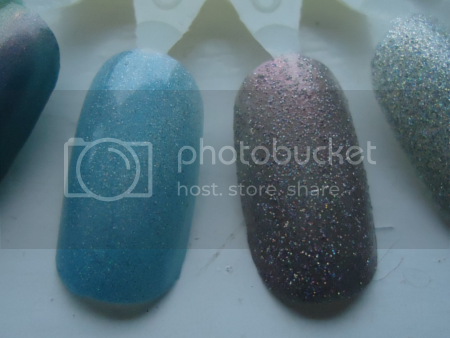 The second one I have is Gem, which is a grey/taupe holographic. In some lights it almost looks a dusky pink. It's really interesting - I don't have any other holographic polishes this shade. See? Gem dries with a much rougher finish. I think the holographic particles are chunkier than in Absolute. Still, it does have the advantage of making the holographic effect more pronounced. The grittiness really bothers me for some reason, but I'm still glad I have both these colours in my collection.